2007 - Regalos a la mamá de Aibachan! After 4 years with weebly as our host, we decide to move to a more interactive host as Blogger. We will continue this site and not cancelled because there is soooo much ARASHI information there that it will be sad deleted. 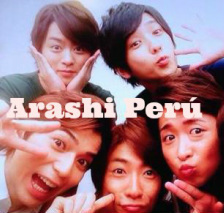 We invited you to check the site at its new host: www.arashi-peru.com as usual we will continue providing all the information of ARASHI. Después de 4 años con Weebly como nuestro host, decidimos mudarnos a uno más interactivo como Blogger. No cerraremos esta cuenta debido a que hay tanta información de ARASHI que sería triste que se borre. 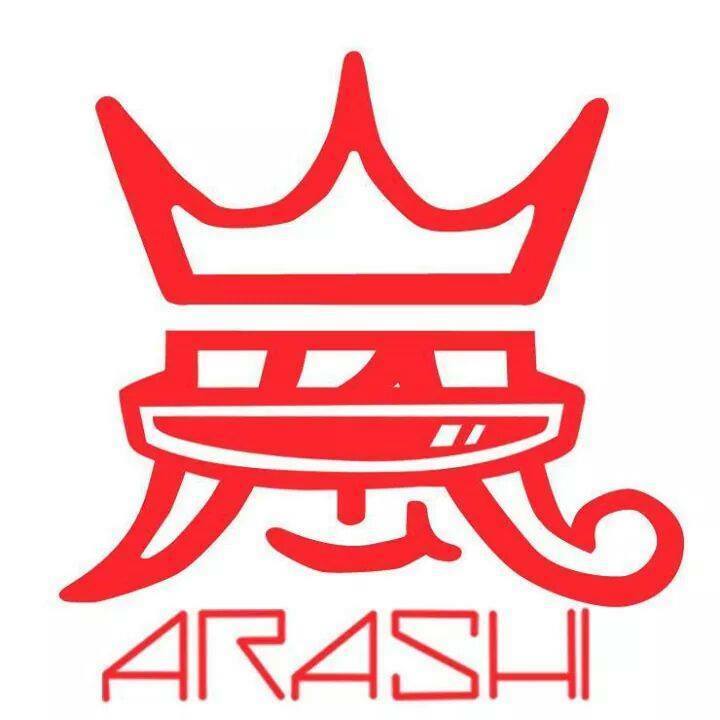 www.arashi-peru.com y como siempre seguiremos informándoles acerca de ARASHI. 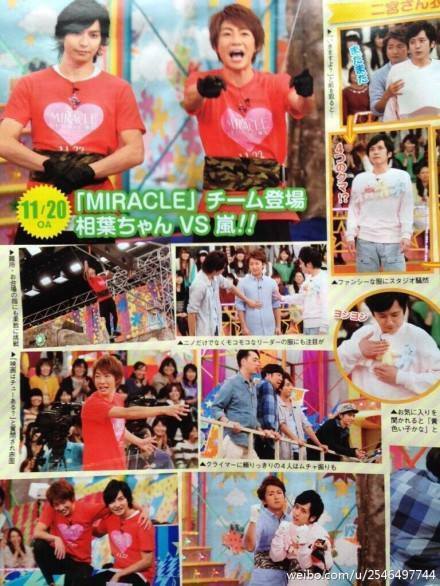 For the VS Arashi of November 13th the guest are the actors of MIRACLE so that means that Aibachan will be playing against Arashi. Toma a Aibachan look so cute and as always Nino is showing us his fashion statement with cute bears on his sweater. Para el próximo VS Arashi del 13 de noviembre los invitados serán los actores de MIRACLE y eso significa que Aibachan jugará en contra de ARASHI. 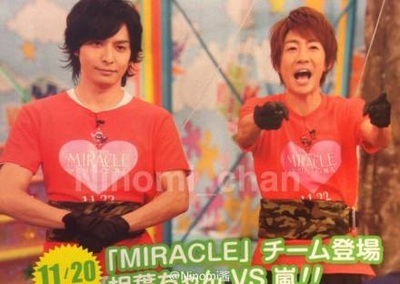 Toma y Aibachan se ven super lindos y Nino como siempre mostrándonos su estilo de moda con unos bellos ositos en su chompa. 2014.11.05 AD - Thirty-Six StrategemsGood morning. 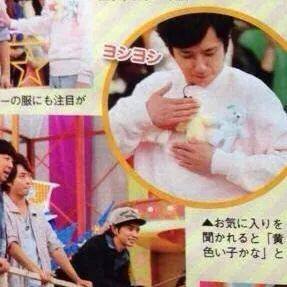 This is Arashi’s Ohno Satoshi. "Of Thirty-Six Strategems, fleeing is best." This is one of the Chinese battle Strategems. This means that in unfavourable situations or times of confusion, rather than polishing up one’s plans, the best plan is to flee when one should flee and protect oneself. Ohh. So fleeing is winning. "Speaking of which, the agency has assigned homework to Ohno-san." "Eh, the deadline is tomorrow? And it’s pretty tough too… Ah, of Thirty-Six Strategems, fleeing is best! Right, I’m going fishing!" But man, there are definitely times when I want to run away. But in reality, you can’t run. It’s a problem of reality. Well, if you do it yourself, it’s still… It’s still just your personal responsibility. Afterwards. You’re only dependent on yourself. 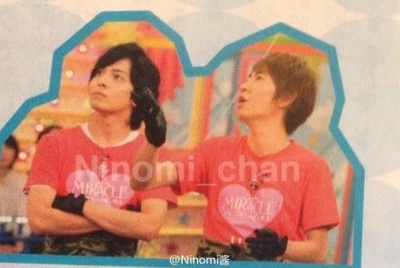 It’s just that, I’m doing this with the members. Mm. There’s no replacement. So if I were to run away, I’d cause trouble for the rest, so I can’t run. And the concerts are approaching. And right now, honestly, everyone’s fighting on. There’s choreography to learn, songs to memorise, positions to remember. But if I were to run… I can’t run. (laughs) The audience’ll be waiting. But of course. So you just gotta do it right, or rather… In the past, for stageplays and stuff - well, concerts were a given, of course, but I was suddenly handed a script. 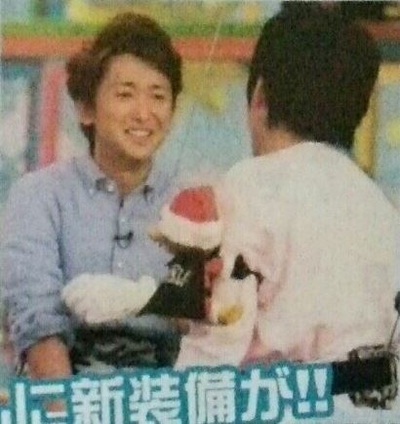 "Ohno, you’ll do a stageplay this time?" That was what it was like. I was handed this super thick script, full of lines. And there was less than a month to go. 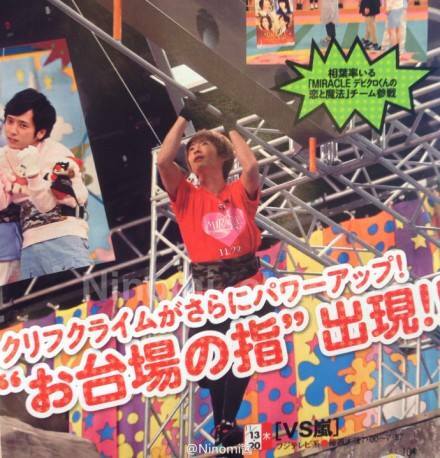 In less than a month, there’d be the actual show. And there was already audience pre-booking. You’d want to run, wouldn’t you? Not even a month from now on ‘til the actual show? Man, but well, at first I thought it couldn’t be done. But then I definitely couldn’t escape. So in any case, I just desperately did my best. Training and all. And then when the actual show came, I did it. With one thing or another, I thought that was amazing. The power of humans. Probably, if there was no deadline I’d be moving at a snail’s pace. But well, naturally, there was that deadline. I couldn’t help but do it. I couldn’t run. The objective’s important, huh? This sort of easy-going-ness is scary, huh? Yeah. 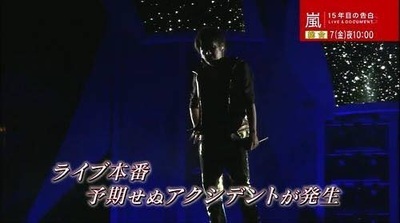 That’s all; this was Ohno Satoshi! . 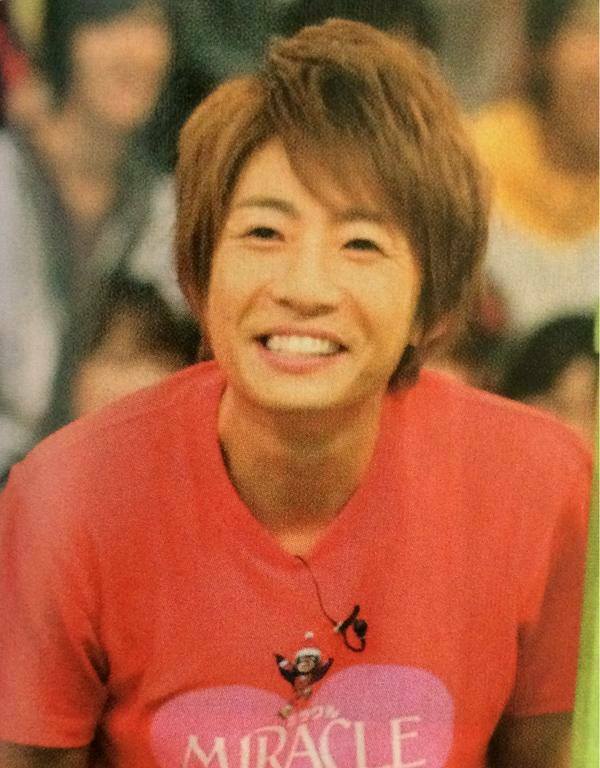 2014.11.04 AD - Monthly happiness.Good morning. 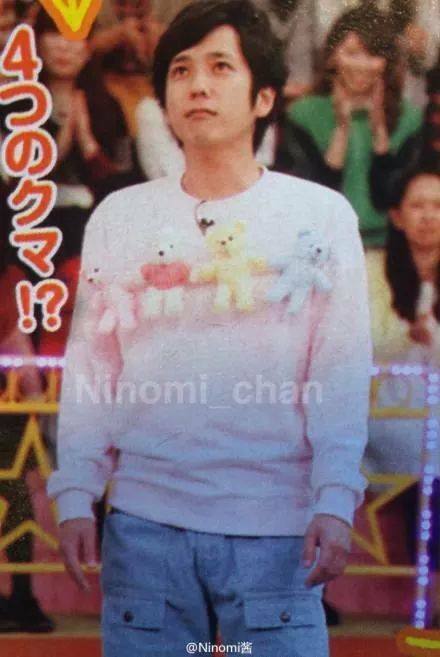 This is Arashi’s Ohno Satoshi. "Happiness comes every month. It’s just that if you’re not ready to accept it, you overlook most of it. Don’t overlook happiness this month!" 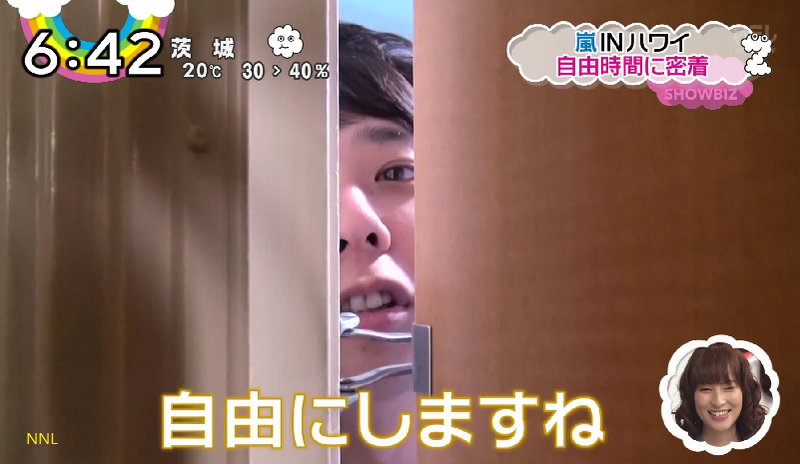 "Ohno-san, good morning. When I heard this quote, I thought that happiness is like chance. It won’t come if you wait for it. 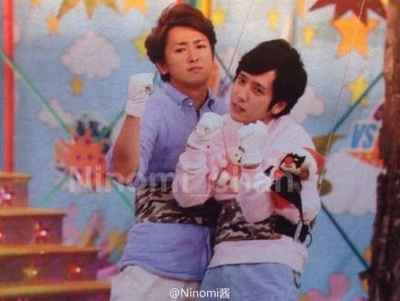 Ohno-san, are you ready for happiness this month?" I see. There’s happiness every month. The happiness this month… already happened yesterday, right? Our debut day. 3rd November. That’s 15 years of happiness, isn’t it? And then there’s another one. On the 27th of November. That’s when Bruce Lee was born. That’s happiness, that is. And then 30th November. 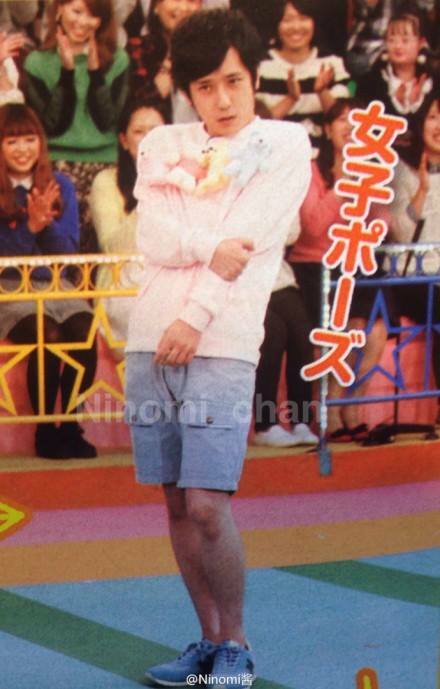 That’s when Hey!Say!JUMP’s Chinen-kun was born. That’s happiness! And then needless to say (laughs) 26th November! I was born! 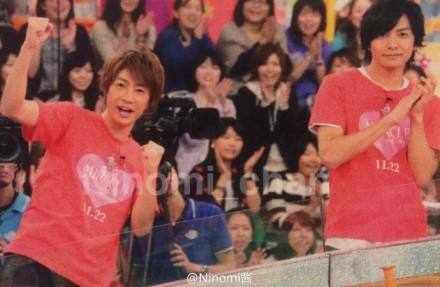 (cheers and applause) It’s just full of happiness, come to think of it. Man, I’ll be 34. But honestly, I want to become 40 soon. 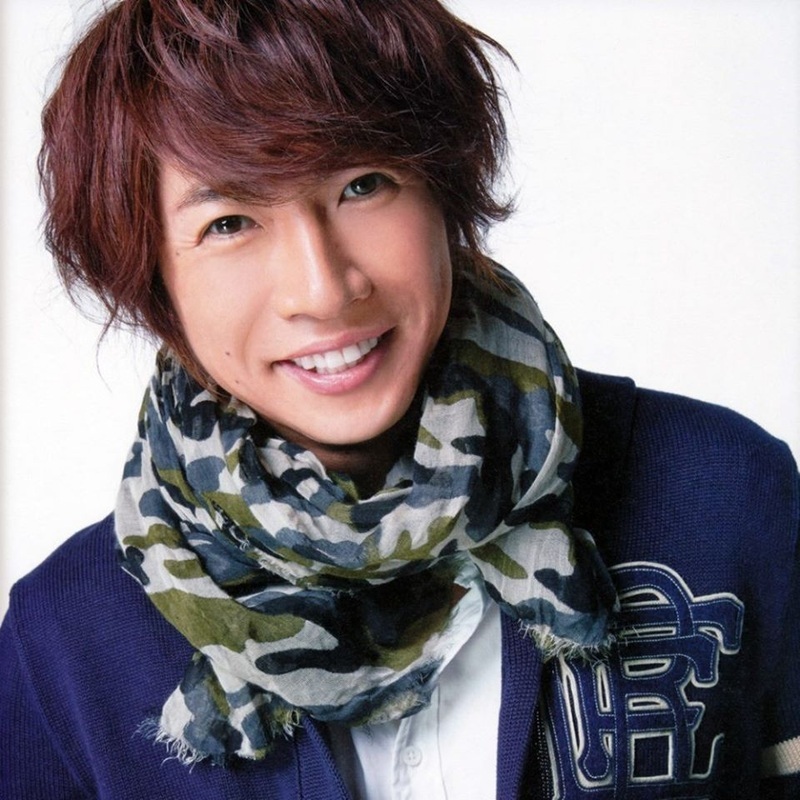 Currently, right… guys who are 34 like me. How do you feel? Just asking the guys. How do you feel? Like in all sorts of… Like what sort of position do you hold at work? And then is 34 still young? Or do you think of yourselves as old men? Stuff like that. I still think I’m too young. 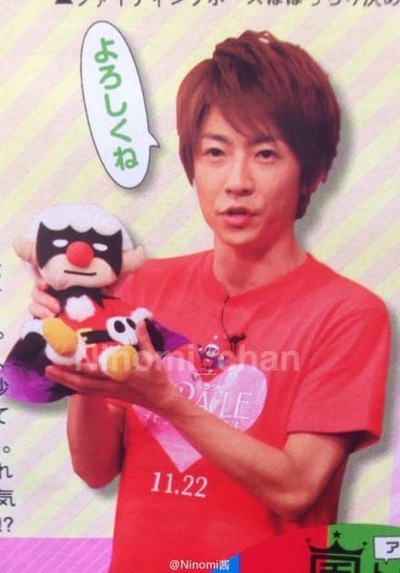 So do you want to hurry up and become 40? Do you want to go back to your 20s? I kinda want to ask those sorts of things. The views of people of the same age. So like… What sort of positions would they be in? 34 year old men. Like what are you thinking about now? I’d like to open this to submissions. I’m curious! Mm. I’d like to read that. So by all means, to the 34-year-old men nationwide, how do you feel now? Please tell me! 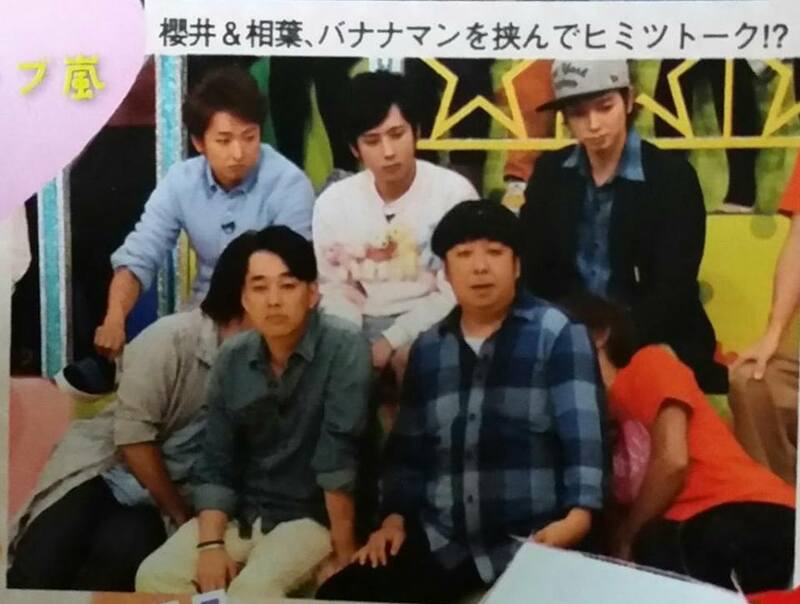 2014.11.03 AD - Arashi x A.RA.SHIGood morning. 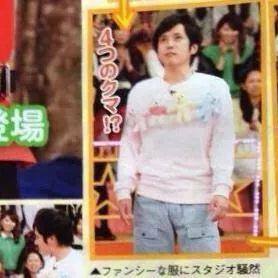 This is Arashi’s Ohno Satoshi. "Even if people of the same personality band together, the power is only a sum of the total. If people of different personalities unite, it will be the product." This is a quote from the captain of the main Antarctic wintering party,Nishibori Eizaburo-san. 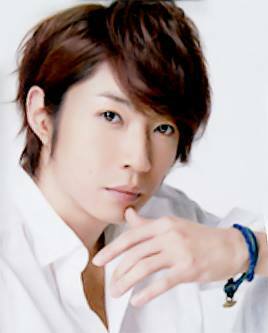 "Oh-chan, good morning. 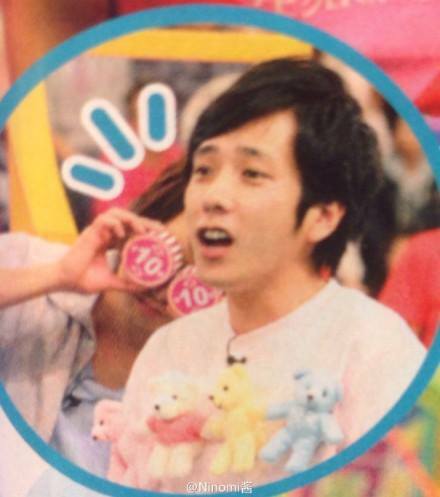 I thought that this quote perfectly expresses Arashi’s 15 years. Multiplication instead of addition. With the members’ different personalities combined, it transforms into a new appeal that’s exponential. Furthermore, multiply that by 15 years and to me, that’s a power that cannot be counted!" Time flies! But well, feels like the 5 of us have always been together. Well, often, with the 5 of us, um, I guess it’s since we’ve gotten to act together or something. I mean, yeah, when the 5 of us have to wait and stuff, I have that impression. I was making figures. They were little ones, so I’d be making them with a toothpick. Mm. Well, so it was something like that. I guess it’s always been like that? It still hasn’t changed even now. So it’s the 3rd of November. But surprisingly, in these 15 years, 3rd November tends to be a day off. So for some years, we never had any grand celebrations. Seriously. It’ll be a day spent alone thinking. So while I’m alone in anguish over my choreography, I think I’ll go home alone and have a drink and sleep. So for this day, yeah… Please think of that. Escuchamos que empezaras tu tour en noviembre pero antes se dará el especial de la NHK "Live&Document - 15th Anniversary Confession" que saldrá el 7 de noviembre. El diario de Ohno se revelará por primera vez. No es algo fantáticos. Cuando tenía 20, mi madre me dijo :"escribe en el" y me dio un cuadernos. Yo le respondí: "entendido". Es algo que empecé a escribir para luego disfrutarlo cuando me retire. Lo leo cuando estoy domando y pensaré "hubieron tiempos como estos". Todos mis diarios estan en la casa de mis padres. Fui a casa a sacarlos y había pasado mucho tiempo desde la última vez que lo leí. Así que los volví a releer. It isn’t a very fantastic thing. Back when I was 20, my mother told me ‘write on it!’ and gave me a notebook, I replied ‘got it’. It was just a thing I wrote to be enjoyed on my retirement days. I read it while drinking liquor and I thought ‘there’s time like this’. All of my diaries are in my parents’ house. I went home to take it and it’s been a long time since the last time I read it so I re-read it all. 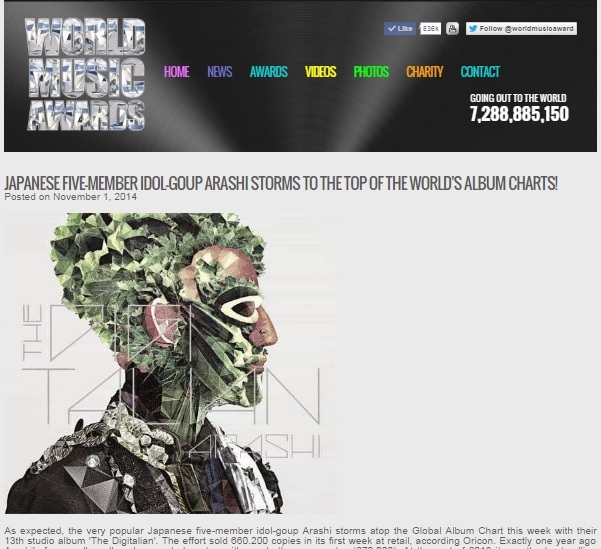 En la página oficial de World Music Awards, como cada semana hacen la reseña del artista de mayor venta con single y álbum. 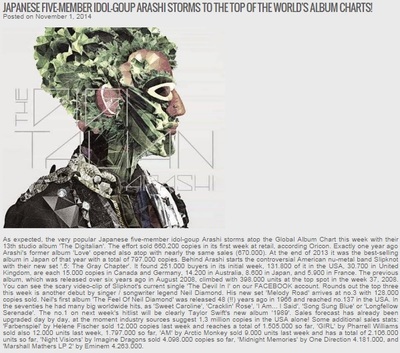 Esta semana nuestros amores de ARASHI están como los artistas de mayor venta a nivel mundial en la categoría de álbum. Nos llenamos de orgullo de ver a nuestros babies de ARASHI llegar al primer lugar. Seguiremos trabajando como sus publicistas nos oficiales para que esta hermosa tormenta siga creciendo y sea imparable. 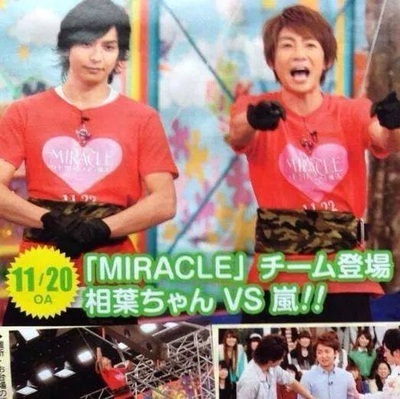 Esta es una noticia que nos alegra mucho y ojala los babies de ARASHI tambien lo puedan ver. Su album The Digitalian, es el álbum de mayor ventas a nivel mundial. Un grupo cuyo mercado de promoción es Japón ha llegado a la tabla de ventas mundiales. 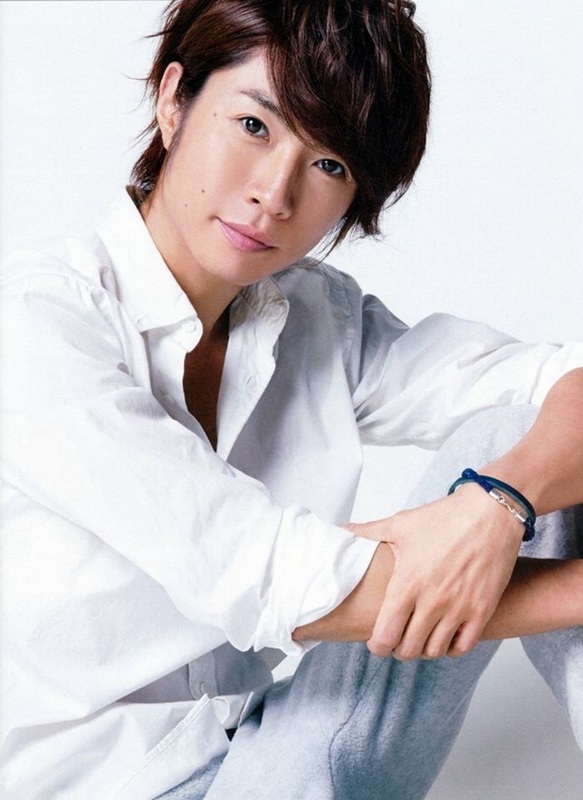 Sería bueno que el tío Johnny revisará de vez en cuando esta páginas y se le prenda el foquito de que ya es hora de sacar a ARASHI al mundo a través de las redes sociales. Soñar no cuesta nada pero seguiremos nosotros los fans haciendo el trabajo de publicistas para ARASHI. Omedetou Babies por tremendo logro! 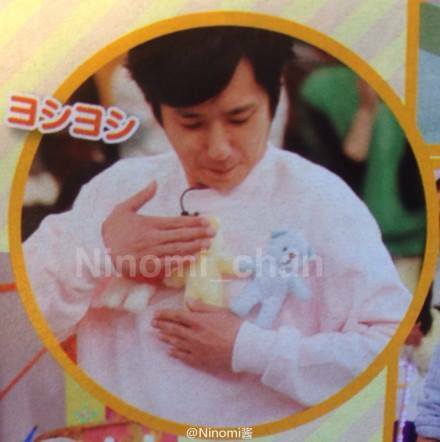 This is something that makes us really happy and we wish that ARASHI also could see this. 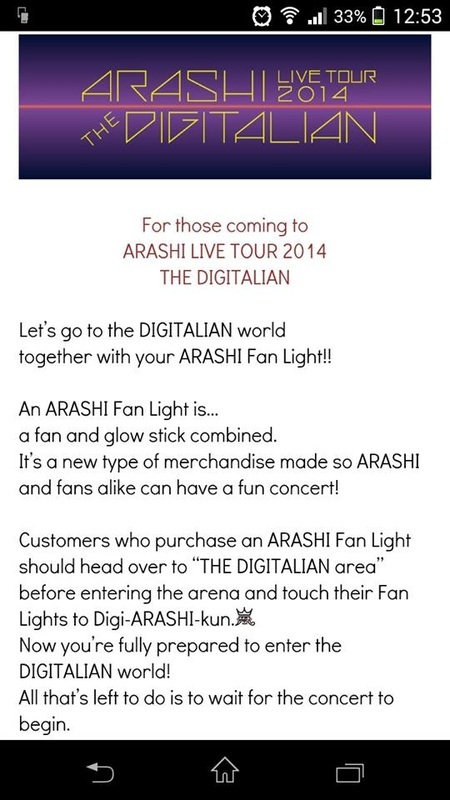 Their new album "The Digitalian" is the best sell album around the world. 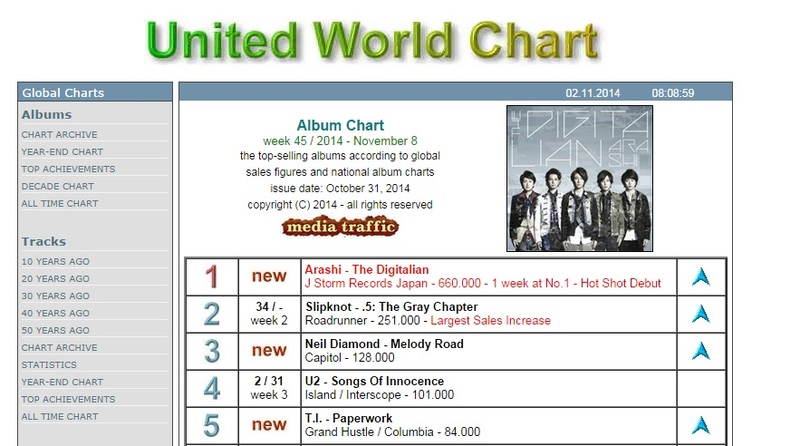 A group where there market is only Japan to be able to get to the top of the list worldwide is awesome. We wish that uncle Johnny could review this page once in a while and finally get the idea that is time of ARASHI to go Worldwide through the social networks. 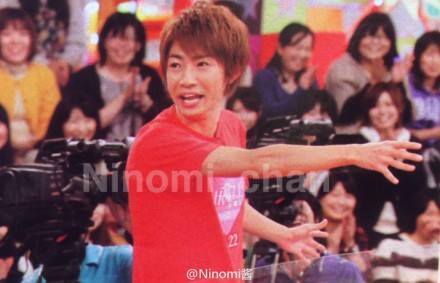 Dream about it doesnt cost but as fans we will continue to be the unofficial PR of ARASHI. Omedetou babies for this amazing achivement! El día de hoy 1ero. 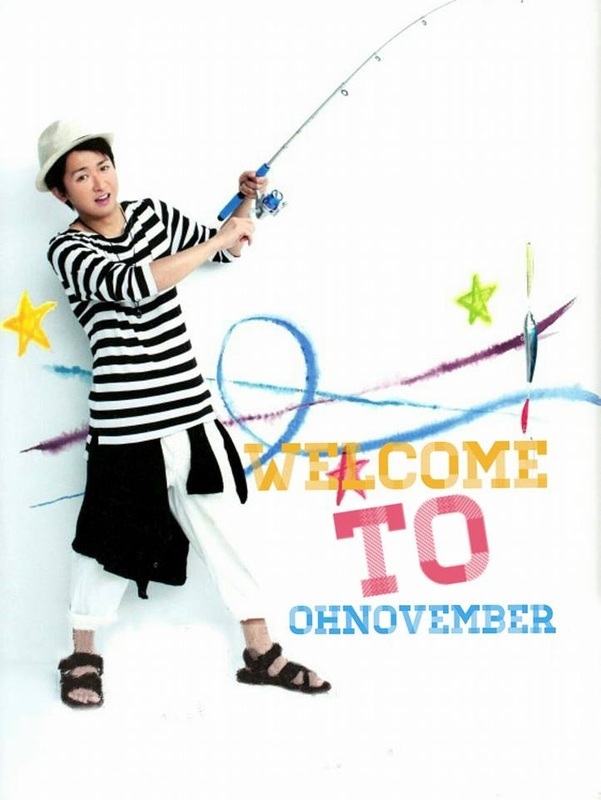 de Noviembre damos inicio a la cuenta regresiva para celebrar el cumpleaños de nuestro Líder Ohno Satoshi. El 26 de noviembre es su cumpleaños y celebraremos sus 34 años. Quien ve esta foto pues no pensará que ya esta en los 34. Recuerden que la proyección Masatoshi Blast será el 30 de noviembre en el auditorio del Touring de 3pm a 8pm. Las entradas están a la venta en la tienda Asian Shop ubicada en el Centro Comercial Arenales. En el segundo comercial del especial de ARASHI para la NHK nos han mostrado un lado que usualmente el tío Johnny no lo comparte que es mostrar que sus Idols dan mucho de ellos. Acá vemos que Nino no estuvo sintiéndose bien durante el concierto en Hawaii. El dolor en su espalda es un rumor que se viene manejando por meses pero nadie lo decía. Ahora viéndolo en el especial pues nos damos cuenta que sí, Nino esta sufriendo de dolores en la espalda. Esperamos que Nino se este cuidando y agradecemos todo su profesionalismo pero no deseamos que eso perjudique su salud. 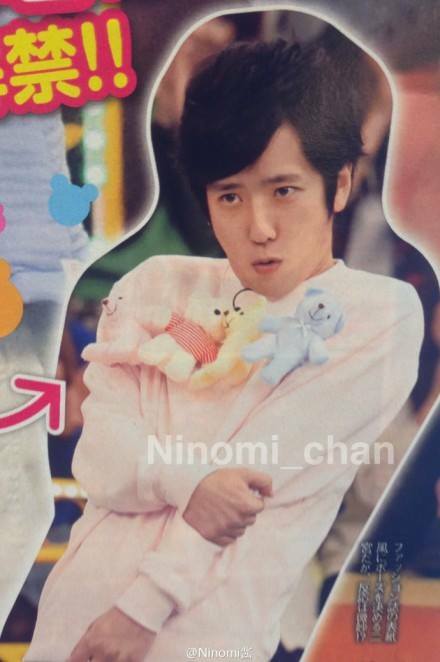 Gambatte Nino! 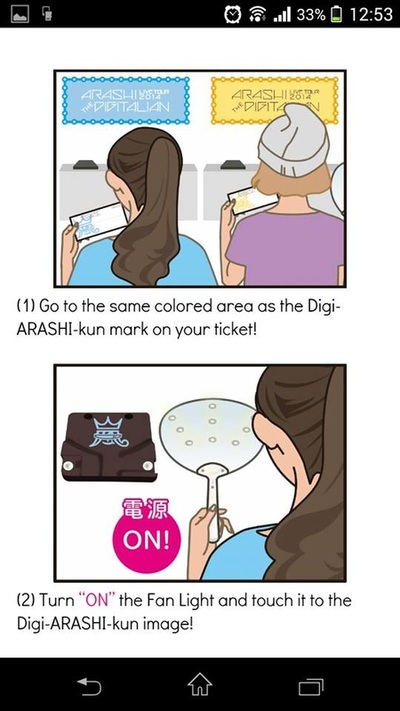 Como siempre las fans de ARASHI estamos en todas y pues ya arreglaron los logos del próximo concierto de ARASHI - The Digitalian. 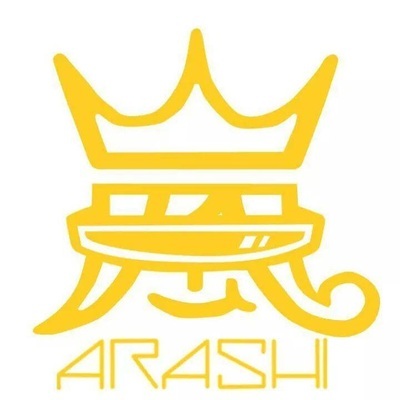 Están totalmente geniales y definitivamente el logo del príncipe llegó para no dejarnos pero se adapta a todos los estilos del concierto de ARASHI. Y salió un mensaje que ha puesto de vuelta a las fans de ARASHI, pues resulta que la Uchiwa solo encenderá cuando pasé por un sistema de activación al ingreso del concierto llamado el Digi-Arashi-Kun. Parece que estos goods van a estar espectaculares. Que penita que no esta pensando en aquellos fans que no podemos ir. 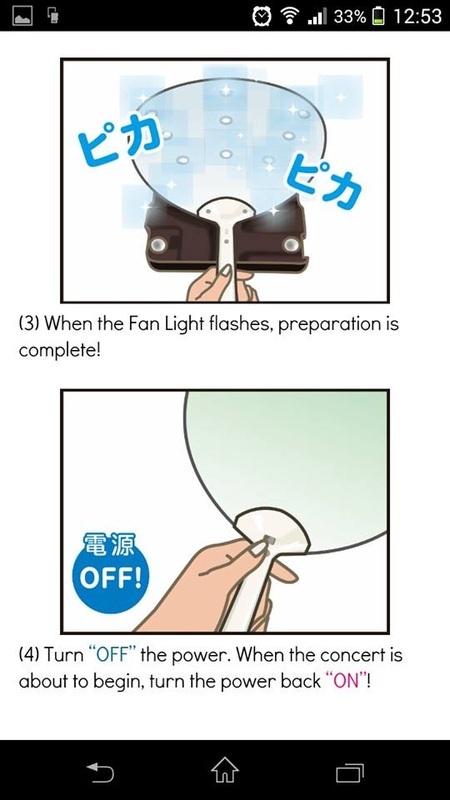 Se van a extrañar las Junbo Uchiwas y las grupales. Crédito de capturas de fotos: Cool-and-Soul Chile. La página hermana de Ninolandia On, tradujo parte del CM de ARASHi ni Shiyagare SP donde se le pregunta a Nino acerca de su día libre. A continuación la traducción. Por qué se ve a Nino encerrado en su habitación del hotel en Hawaii? 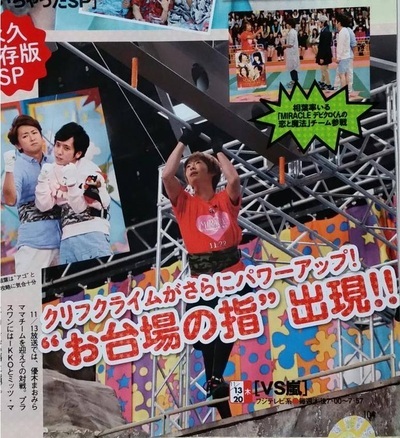 Eso es porque, Nino tuvo que usar su único día libre para aprenderse el script para su drama sp que tenía que grabar al regresar a Japón. 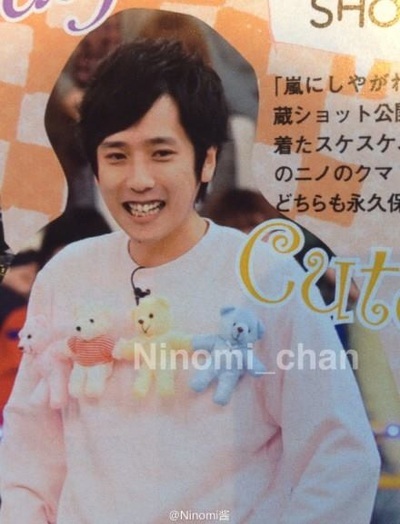 Recordemos que según Riida en una última entrevista Nino quería ir con Jun y Ohno a bucear con ellos pero no podía broncearse porque debía grabar luego para el drama SP. 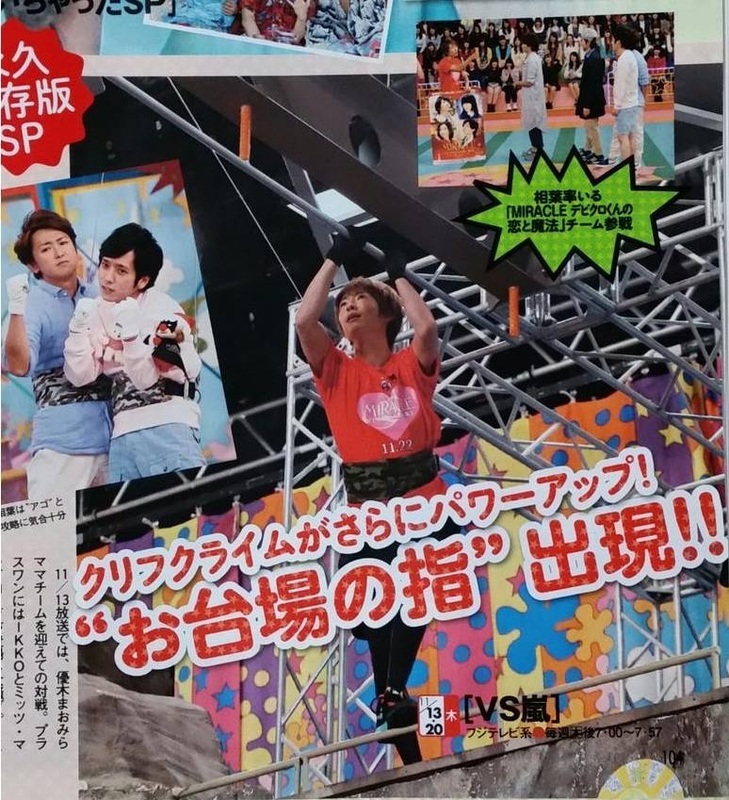 Nuestra página hermana de Junbait Palace tambien tradujo parte de la conversación de Jun y Satoshi en la revista TV Guide. Acá nos muestran su emoción y nerviosismo por el concierto de The Digitalian. Sobretodo vemos que tan envuelto y tan personal será este concierto para ARASHI. Contando los días para el inicio del tour. 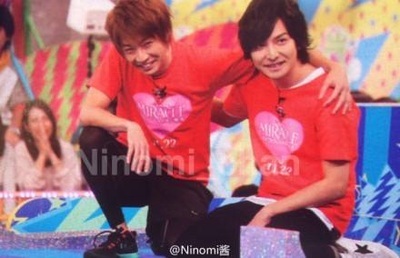 Gracias a las hermanas de Junbait Palace por siempre mantenernos al día de lo que dicen de nuestro querido J. Waaa el ARASHI love se siente tan fuerte entre ellos. Bajate la aplicación y lleva a ARASHI PERU en tu celular. Aplicación para Android y Iphone. Solo escanea la barra. 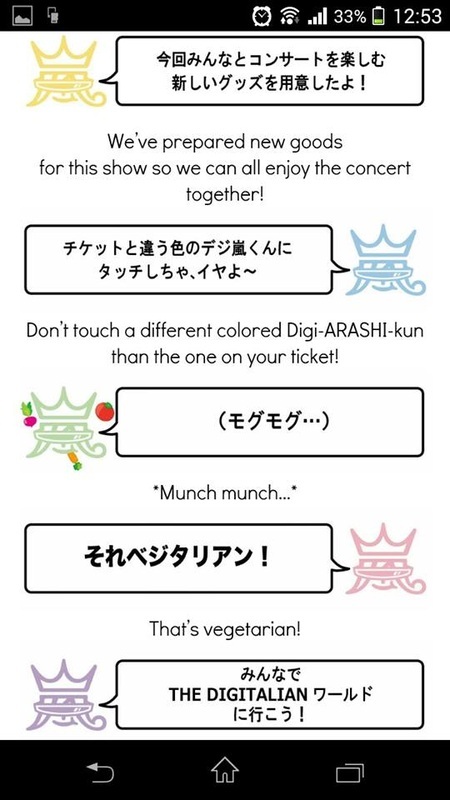 Download the application and have ARASHI PERU in your pone. Ready for Android and IPhone. 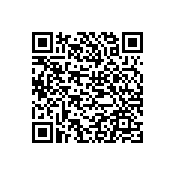 Just scan the barcode. Todas las noticias de Arashi las encontrarás aquí! Dale click al botón "Like" y "Tweet" para compartir nuestras notas en Facebook y Twitter. Necesitamos de cada uno de ustedes para que la tormenta siga creciendo. Compartan la info arashiana a más personas a través de sus redes sociales! Disfruta de lunes a viernes del único programa online dedicado 100% a la difusión de ARASHI. Haz tus pedidos musicales en el chatroom y comparte el link con toda tu gente. Todo material expuesto en esta página es propiedad exclusiva de ARASHI PERU, de sus autores originales y las fuentes correspondientes. Está prohibida la reproducción total o parcial de este sitio. 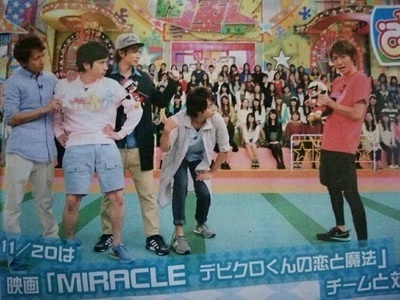 NO TENEMOS CONTACTO DIRECTO con ARASHI, Johnny & Associates, ni cualquiera de sus representantes. Esta página es un FANSITE creado por fans para fans.